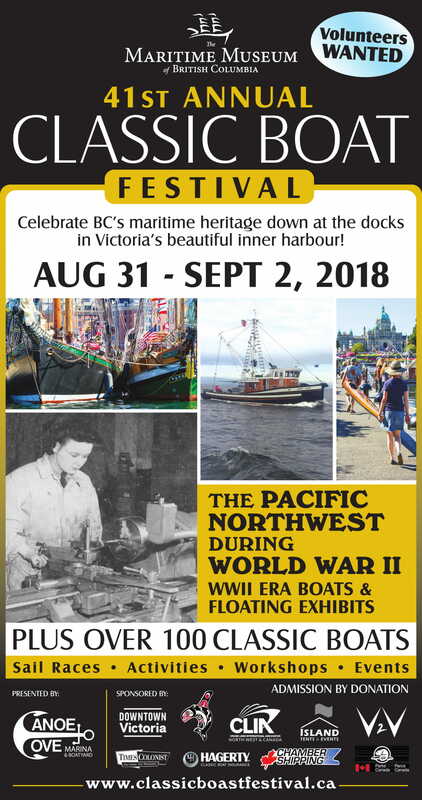 The Maritime Museum of BC is proud to host the annual Victoria Classic Boat Festival in Victoria’s beautiful Inner Harbour! For over 40 years, the Victoria Classic Boat Festival has showcased classic boats from all over the Pacific Northwest each Labour Day Weekend. Each year, approximately 10,000 visitors tour the docks and the boats on display. In 2017, the Maritime Museum of BC took over operations of the Festival, incorporating marine-related exhibitions and family-friendly programs into the weekend’s activities. The Festival is run by Museum staff, Board members, and dedicated volunteers. Community, corporate, and business sponsors provide enormous support to the Museum and it’s mission to promote and preserve BC’s maritime experience and heritage and to engage people with this ongoing story. Join us on the docks this coming Labour Day Weekend, Friday, August 30 – Sunday, September 1 2019!